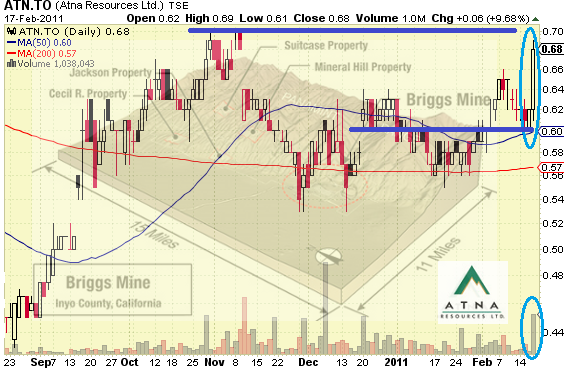 The shares of Atna Resources Ltd. (TSE:ATN), (PINK:ATNAF) are on the rise again. The advance from the last session on the Toronto Stock Exchange (TSE) came on an impressive volume and on no new company developments. Yesterday, the stock moved almost 10% up on both the TSE and the American OTC market. On the Canadian Exchange, the rise was confirmed by a large volume of 1.04M shares - this beats four times the average turnover. ATN closed at $0.68, which is very close to its year-high. The chart suggests that ATN could find support at $0.60, while $0.70 could serve as a resistance level. The mined gold marked 88% increase from the previous quarter. Atna's financial position looks solid, as it recently completed a $9.2M bought deal financing. The company seems to have enough capital to fund the Briggs Gold Mine leach pad extension and Phase 1 infrastructure development at its Reward gold project. Still, Atna has several problems to worry about. The company continues to incur losses, in spite of the ongoing production at the Briggs Mine. For the Q3 of 2010, the net loss was over $2.8M. Atna has a huge debt of $16.8M that deserves attention too. These are factors that could hurdle the advance of the shares and force them to move negatively in the future. The company cannot as yet realize any profit from its activities. The current prodiction revenue is not enough for Atna to generate positive income. Unless this happens, the company's efforts will be of much less value to shareholders who want earnings and not losses. They are surely not satisfied with the present negative EPS of $ (0.03).